A life long resident of Atlanta, Georgia, Barbra Rosing attended the University of Alabama and the University of Georgia for her didactic undergraduate studies. In 1992, she graduated from the Physician Assistant program at the Medical College of Georgia in Augusta. Upon graduation, Barbra worked for three years as a certified physician assistant in a private neurology practice where she assisted in their major pharmaceutical research studies. 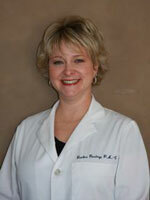 In 1995, she officially joined the Atlanta Center for Dermatologic Diseases as a certified physician assistant. This was a happy homecoming since she had worked previously for the Atlanta Center for Dermatologic Diseases as part of the front office staff throughout her high school and college years. Barbra is a member of the AAPA, GAPA, and GDPA. She enjoys reading, gluten-free cooking, and spending time with her husband and two small children.